Villa Madelise is a new exclusive, modern 3 bedroom property situated in a private 12 villa cul-de-sac in the picturesque village of Peyia The villa is in its own private grounds including private pool (8x4m) with roman steps for easy/safe access, large surrounding tiled area for sunbathing. Furnished to an extremely high standard upstairs there are 3 large double bedrooms all with balconies and sea views, en-suite to the Master bedroom The living area consists of a large separate well equipped kitchen and breakfast room includes dishwasher, washing machine The open plan seating and dining area accommodates 6/8 comfortably has patio doors leading to pool and adjoining cloakroom and walk in shower. The high level of furnishings continue including free 6MB Wi-Fi, Satelitte TV (including sports), DVD and PS3. The whole villa is fully air conditioned. Every effort has been made to help make your stay here a truly relaxing experience, such as complimentary champagne and Welcome Pack provided on your arrival. We are a family of 4 who have bought this villa for our own enjoyment and holidays as we love the island so much and how family friendly everyone is. Because we are not able to stay as much as we would love to we rent out our villa for others to enjoy the idyllic island of Cyprus. As our children have grown up with the villa it is very family and child firendly such as stair gates at top and bottom of stairs. We like to think peole who stay feel it is their villa and tried to have everything available we would want as a family when staying. En-suite to master bedroom with w/c, hand basin and walk-in double length shower. Family Bathroom, w/c, hand basin, bath with over head shower. Downstairs w/c with hand basin and walk-in double length shower. Using Air Conditioning and Gas Fire. On street and off street parking on hard standing. 6MB internet connection through out the villa. Able to use Netflix, Amazon Prime with your UK subscription. All towels and beach towels provided. Large fridge to store all your items in the hot weather. All the pots, pans, glasses and plates you could need for your stay. Extensive plastic plates and bowls for outdoor use plus BBQ tools. Separate dining are with formal dining table and 6 chairs. Selection of books please add more as we like guests to swap their books. Collection is in the kitchen. Large balcony running full length of the house with table and 4 chairs adjoining to master bedroom and bedroom 2. The Troodos mountain range is a 1 hour car ride away. The highest peak is mount Olympus at 6154ft. There are 4 main slopes, all with lifts, from beginner Hera to Advanced Zeus. Skiing lasts from January through to April, and where else can you can ski in the morning and be back to swim in the afternoon. In the summer Troodos allows for relaxing walks and majestic views. Peyia is an ideal location for Tsada Golf Club, Aphrodite Hills & Secret Valley Golf Club. Tsada Golf Club is situated near Tsada village, just 15 minutes' drive north of Paphos town. Founded in 1994 on the hills of Tsada, it is set in the grounds of a 12th Century monastery in a gentle valley. It plays to a par 72 and measures 6060 metres. At an altitude of 550 metres above sea level ensures cool breezes during the summer. The Aphrodite Hills golf course is the centrepiece of as exclusive project encompassing a 5* hotel, villa development, tennis academy, health spa and village. The championship golf plays 18 holes with a 71par and measures 6665m. It lies 20km from Paphos on the road to Limassol. The Secret Valley Golf Club. It is located 18km east of Paphos near Petra tou Romiou. The villa is perfect for children, with it's large pool, and being close to sandy beaches, and it's quiet and restful for adults too. Villa floors are tiled and can be slippery when wet, so please take care with children when they have been swimming. A/C units are provided, but these can lead to colds/ flu like symptoms if misused (ie moving from hot / cold). Notes on accommodation: There is free air conditioning and Wi-Fi in all bedrooms, lounge and kitchen. The lounge and dining room have patio doors opening onto the pool area with table and chairs. Bedrooms 1 & 2 have patio doors that open onto upper balcony with table & chairs where you can have breakfast. Bedroom 3 has patio doors opening onto it's own balcony. All have stunning sea views where better to enjoy a pre diner drink and enjoy the views. Outside: Outside one can enjoy the private swimming pool and patio areas, which are the focal point of our villa. This is the place solely for you to rest and relax in. All necessary garden and patio furniture are provided. Utility Room: Washing machine, steam iron and ironing board, Mclaren pram and storage space. Cleaning / Towels / Linen / Maid service: Towels, beach towels and bedlinen are included. We provide enough for each stay with extra set for 2 week stays. Maid service on changeover (extra maid service is available at an extra charge paid locally usually around 40 Euro). Other: A formal dining area leading off from the living area over looking the pool with seating for 6. In the living area 1 of the sofas converts to a double sofa bed. Cot, high chair available on request. W/C and walk-in shower. Stair gates fitted top/bottom. 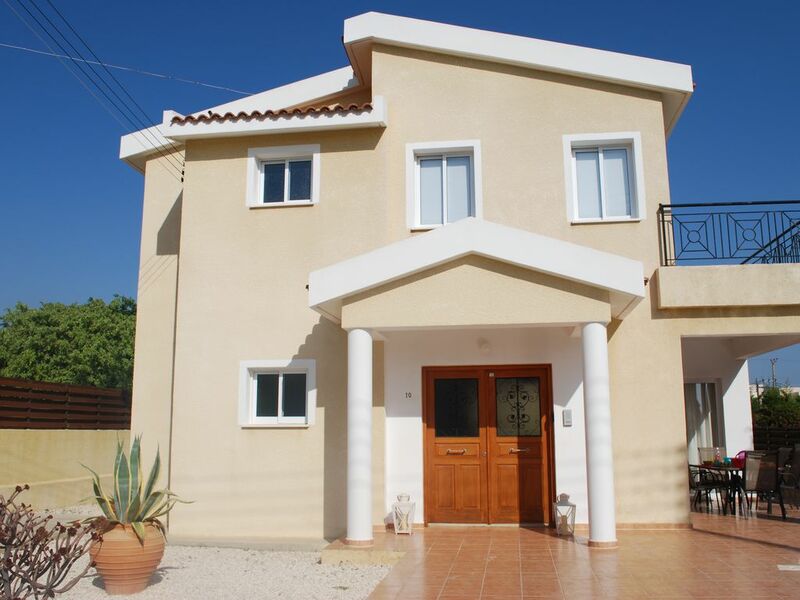 Well equipped and located villa on the beautiful island of Cyprus. All you need for a wonderful holiday. We are so glad you had a great stay at the villa and it was a pleasure to have you stay with us. We hope to have you back soon to stay again. Just returned from a lovely stay for 4 weeks in beautiful Villa Madelaise in Peyia everything that you could need as regards utensils etc are provided,the villa is very clean and tidy and spacious could not fault it at all.Would certainly recommend it to anybody, it is in a lovely area with plenty of bars and takeaways near.Thanks to Mike the owner, it felt like a real home from home. Thank you very much for providing a review and we are so glad you had a great month staying at the villa. We were especially impressed with the dip in the swimming pool as I know how cold the water can be at this time of the year! We stayed at this villa and were very pleased with the quality accommodation, clean and well presented. Would recommend this villa as it is conveniently located for visiting Paphos and Coral Bay, and has local bars, cafes within 10 minutes walk and Peyia village is a short drive away. Especially enjoyed relaxing on the balcony with an unobstructed sea view. Thank you very much for the lovely review and recommendation. We are so happy both of you, like us, enjoy sitting on the balcony and we particularly love to watch the amazing sunsets from there. We couldn't believe our luck with this villa. It was absolutely stunning with every amenity we required. We only went for a short break but everything we needed was in walking distance or a bus / taxi ride away. Mike, the owner, couldn't have been of more help and was always quick to respond. The weather (end of November) was good and we sat outside most days. Would definitely recommend and will definitely return. We are very happy your short stay at the villa was so enjoyable. We want people to get the maximum enjoyment when staying and try to make sure everything you need is provided, such as beach towels. This means you don't have to worry about the weight in your case. We understand this is even more important with a short stay where you just want to immediately relax. Great villa in a good location, clean and with everything we needed. Mike allowed us early check in and late check out which was great as other villa we were in had to be out by 11am and our flight home wasn't until 6.30pm. Had a problem with the fridge freezer, Phil came and sorted it quickly. Pool was very cold but that was expected at time of year. We are so glad you enjoyed your stay at the villa. The fridge freezer seems to have tripped the fuse but it has been fine since so not sure why this happened. Phil came out within an hour to sort it out. We hope to welcome you back again in the near future. Fabulous, comfortable, well equipped villa! Villa Madelise is a fabulous villa which does live up to the photographs shown and mich more, it is a lovely large comfortable place which is so well equipped with many great little touches from the welcome pack on arrival to the beach equipment. Everything has been thought of to make your stay as comfortable and stress free as possible. The location of the villa is good, set among other villas, when we were there it was very quiet. I would say having a car for us was a necessity as there are only a few bits within walking distance. As a group of 4 adults we had a fantastic stay at this lovely villa, enjoying the peacefulness of relaxing around the pool during the mornings before heading out re visiting old haunts from our time living on the Island. I would most definitely recommend Villa Madelise and we will be returning for another stay. Thank you to Mike and team for a wonderful stay. Paphos, an UNESCO world heritage site, is the ancient capital of Cyprus and former fishing port the often accredited as the birthplace of Aphrodite. The ancient sites and archaeology preserve this noble past and the harbour area builds on this, mixing old and new, to provide a perfect holiday destination in the sun. Coral Bay is a 5 min car drive away. Here you will find a choice of beaches, water sports, cafes, restaurants and the most beautiful sunsets. A drive to the Akamas is recommended where there are plenty of unspoilt, deserted beaches on the way. Also the is the amazing untouched beach of Lara bay (Turtle Beach) where the turtles come to lay there eggs on a night. Paphos International Airport is a 20 min taxi transfer journey. Larnaca is an hour and three quarters journey by car. Car hire is highly recommended if you want to get out & about and discover Paphos and its' surrounding areas. Peyia village centre is a leisurely 15 minute walk. The centre of Peyia is regarded as one of the nicest villages in Cyprus with a beautiful Church, stone square and ancient ruins. It has a reasonable number of restaurants and bars, along with take-away food. The supermarkets in Peyia stock fresh produce and a great range of products. There are a few banks with cash-machines and a butchers, fresh fish market, bakers, Medical Centre and some other shops. The local village of Peyia offers more than enough to suit any desire with many taverns, restaurants, supermarkets, deli, bakery, fishmongers, banks and not forgetting the famous old church which really is worth a visit. Weddings can be arranged in the garden of the Municipality, just 12 mins walk from Villa Madelise. The Aphrodite water park is a must for all the family, as is go-karting in Paphos & Coral Bay and many diving clubs and water sports all held locally in Coral Bay. You will find an informative Owners Guide at the villa to make your stay as enjoyable as possible.